This riesling is beautifully clean, crisp and dry and is versatile as they come – enjoy it as a patio sipper or pair with seafood, grilled meats or charcuterie. Riesling is also a surprisingly great pair with our King Cole blue cheese. On the nose it displays apple, pear, lemon meringue, guava. On the palate it is bursting with Granny Smith apple, stonefruit and lychee. This was a featured wine in March's Wine Club package, 2018. Appearance: Clear, bright. Very pale straw-coloured core. Nose: Medium aromatic intensity. Pear, orange, lime, green apple, honeysuckle, minerality. Palate: Medium+ acid, medium body. Green apple, white grape, sea salt. Food Pairing: Black olive tapenade, soft cheeses especially goat’s cheese, charcuteries plates with mustard and cornichons, Salade Niçoise, pasta salad with tomatoes and herbs, fresh raw oysters on the half shell. Shana & Gavin Miller are the genius duo who paired a winery with a creamery – Shana heads up the creamery and Gavin is the winemaker. Both Shana and Gavin have had esteemed careers in the wine industry, so it’s not surprising that in only a few short years their brand of Upper Bench wines has amazed the palates of enthusiasts and wine reviewers alike. This Riesling is fantastic. The salinity in this wine really differentiates it from other Rieslings, even those within the same region. 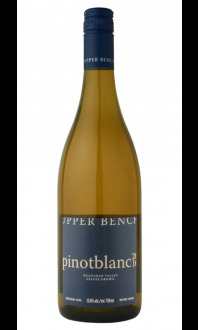 While there’s a healthy, anticipated dose of acidity balancing the sweetness, it’s the subtle salinity that elevates the wine and imbues it with savoury undertones. Enjoy!